Controlled Traffic Farming (CTF) has benefits of confined soil compaction and precision of operations. Automated steering has meant a very accurate system is possible. 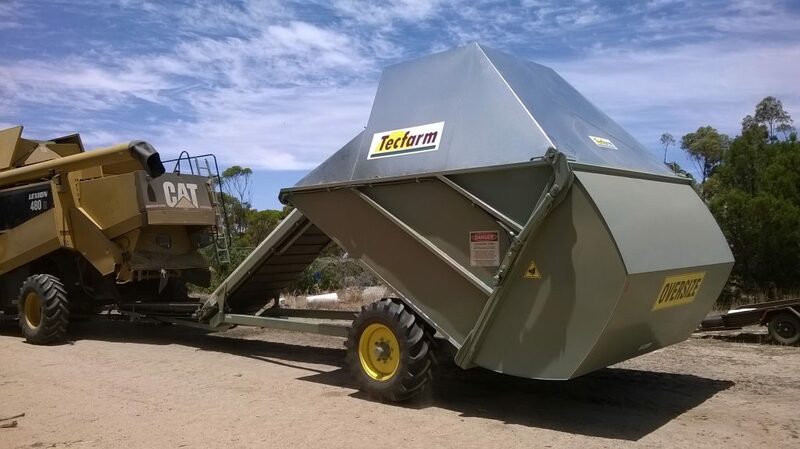 Tecfarm offers a CT Cart, sized at 30 Cu/m or 40 Cu/m with 3 metre track. Careful design of the CT cart gives strength in key areas with light tare weight, so the unit is well suited to smaller as well as large headers. The CT cart also has the unique Tecfarm ability to consistently control dump height, meaning easy drive over at spraying time and seeding through heaps if desired.